Complete under and above ground piping work including fire fighting system, underground coating etc. for hydrogen generation unit of "dhds" project. Installation of under ground piping. Supply of all the material for underground coating works. Supply of all construction equipments like cranes, mixers, road roller etc., manpower, tools & tackles and consumables. testing facility for piping work. Above and under ground fire fighting piping works in process and utilities areas. Supply of all the construction equipment, manpower, tools & tackles, consumables etc., under ground coating material. Fire Fighting piping works and supply of construction equipments. Construction of 7 nos sub station buildings. Piping fabrication and erection for merox and amine units. Supply of power for construction with D. G. sets. Supply of manpower, tools and tackles and consumables. Supply of civil material like bricks, hume pipes, concrete tanks etc. Construction of sub-station buildings and equipment erection. fabrication and piping erection for sea water intake system. Civil, structural steel, architectural works for various buildings like assembly hall, canteen building, laboratory & sample storage, weigh bridge room, time office/gate house and by-product storage room. 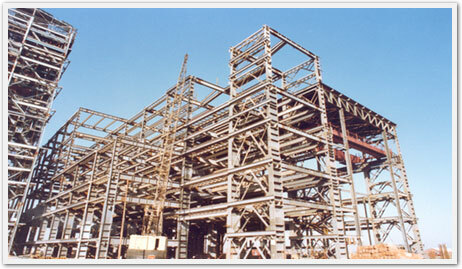 Fabrication & erection structural steel including supply, insulation, painting, u.g. Piping etc for bottling plant. Fabrication, erection of piping, tanks and structural steel in bottling plant.